On 18th September 2015, Indonesian Medan image publicizing ambassador of cancer prevention and treatment, Melani Hapsari, visited Modern Cancer Hospital Guangzhou. The general manager, Lin Shaohua, and the director of international purser department, Sang Li, and other leaders expressed warm welcome to the visitors. Miss Melani Hapsari signed the contact in June 2014 and has played the role of Indonesian Medan image publicizing ambassador of cancer prevention and treatment in Modern Cancer Hospital Guangzhou. She has visited our hospital for many times so as to spread information of authoritative minimally invasive cancer technology to more Indonesian cancer patients and bring a new hope to them. Instead of visiting the cancer patients in our hospital and taking regular body inspection, Melani Hapsari also took the advertising video for 10th annual hospital celebration so that more oversea cancer patients had a better understanding of Modern Cancer Hospital Guangzhou from different aspects. Melani Hapsari took interview with Indonesian patient, Willy suwono. On the afternoon, Melani Hapsari and her friend experienced the service of Modern Cancer Hospital Guangzhou and took the B-ultrasound, electrocardiogram, CT, etc. Melani Hapsari also consulted the director of gynecology, Dr. Lin. According her condition, Dr. Lin carefully answered her questions and made the professional therapeutic regimen for her. Melani Hapsari impressed that Modern Cancer Hospital Guangzhou was accredited by JCI with high score and required higher service standard and more advanced technologies for diagnosis and treatment. She was satisfied with the service here and believed that the high-quality service and cutting-edge medical technology will bring hope to more cancer patients. Melani Hapsari took joint photo with the hospitalized patient. Willy suwono, the Indonesian lung cancer patient, expressed thank you to the visit. They chatted in Indonesian language and Miss Melani Hapsari carefully asked his condition and therapeutic regimen for knowing more details. At the spot, she also took an interview to Willy suwono. Melani Hapsari took advertising video of 10th annual hospital celebration. On 19th September, Miss Melani Hapsari took the advertising video for 10th annual hospital celebration. She claimed that in Indonesia the cancer technologies were only operation, radiotherapy, chemotherapy, which brought a lot of side effects and patients suffered from those therapies. 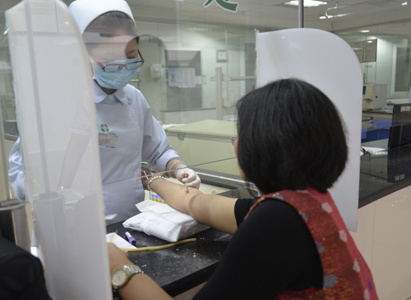 Miss Melani Hapsari hoped that more Indonesian cancer patients know Modern Cancer Hospital Guangzhou and the cancer minimally invasive technologies help them get rid of the suffering life and improve their condition.